Today we learned that Don Featherstone, creator of the plastic pink flamingo, died yesterday at the age of 79. From the plastic bird's birth to its modern perch atop the pyramid of campy Americana, here’s how the hot pink queen of kitsch won over our hearts (and lawns). Perhaps not shockingly, the pink flamingo lawn ornament was invented in the same decade that polyester pants, pink washing machines, vinyl wallpaper, and Naugahyde lounge chairs were cool. Featherstone, a sculptor, was hired by Leominster, Mass.-based Union Products to make three-dimensional lawn ornaments. 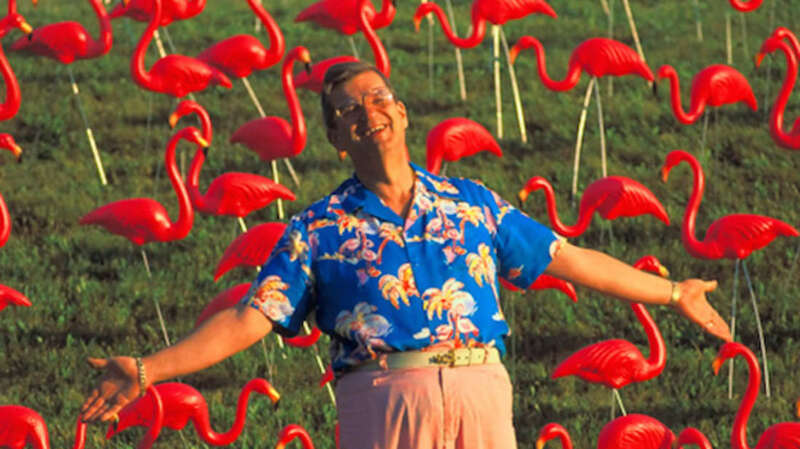 He created the first pink flamingo lawn ornament, his second assignment, in 1957. According to Smithsonian, he used a National Geographic photospread as a reference, and it "took about two weeks to model both halves of the bird, brought into the third dimension by then-revolutionary injection-mold technology." When they first hit stores, the blushing birds cost $2.76 a pair and were an immediate hit in working-class subdivisions from the Redwood Forest to the Gulfstream waters. The 1960s were a decade of backlash against conformity, false experience, and all things Parental—including, evidently, Mom and Dad’s lawn décor. Hippies rallied against the plastics industry, cultural critics chastised all things “un-natural,” and home and garden magazines pleaded with people to abandon the gnomes, lawn jockeys, and flamingos of yesteryear in favor of classier, more natural yard décor. By 1970, even Sears had stopped selling the pink flamingo, replacing the gaping hole in their garden department with natural-looking fountains and rocks, writes Jennifer Price in her book Flight Maps. Happily for flamingo fans, the ‘70s were a carnival of schlock, and by the early part of the decade, the pink flamingo had become so un-cool, it was cool again—this time as a self-conscious symbol of rebellion, outrageousness and all things Bad Taste. By the time John Waters’ movie, Pink Flamingos, hit theaters in 1972, the bird had fully transitioned to the realm of ironic kitsch. Gay bars used them as mascots, transvestites sported them on earrings and platform pumps, and in 1979, students from the University of Wisconsin-Madison planted 1008 of the two-legged creatures in the grass in front of the dean’s office, earning them—and the bird—a place in Wisconsin’s State Historical Society. By the 1980s, the pink flamingo had made the ultimate giant leap for mankind: it had, like Andy Warhol’s Campbell's Soup cans, become art. In 1987, the governor of Massachusetts proclaimed the plastic bird “an essential contribution to American folk art,” Price wrote, and new clubs like the Flamingo Fanciers of America and the International Society for the Preservation of Pink Lawn Flamingos sprang into existence in time to celebrate the bird’s thirtieth birthday. In 1998, the Museum of Contemporary Art in Los Angeles began to sell plastic pink flamingos in its bookstore for $19 a set. In 2009, in honor of the students’ 1979 prank, the Madison, Wisconsin, city council named the plastic pink flamingo the official bird of the city. And the esteemed lawn ornament lives on in Americana infamy, lending its name to bars, restaurants, casinos, and hotels from sea to shining sea; they're even included in the Smithsonian's collection. The birds currently go for about $16 a set online.